We really like potato cakes around here. Potato cakes are not sweet or even a cake. I sometimes use left over mashed potatoes for mine. I love to add onions in ours also. Raven never knows I add onions because I grate them. It is funny how if kids can't "see" the onions in something they will eat them but if they "see" onions it is a no go. I want kids to eat everything that there is and not "pick out" what they don't like. It bugs me, crazy huh? I know... Well this is "what's cookin" tonight. Take your mashed potatoes and add your onion, eggs, flour, salt and pepper. Mix well. Heat oil in a large skillet over medium heat. Drop potato mixture by heaping tablespoons onto oiled skillet. I usually coat the skillet with about 1/2 inch of oil. I use my Lodge caste iron skillet that was my grandmother's for this. Cook on each side until golden brown. This usually takes about 4 minutes per side. I hope you give these a try. They are really good with beans or polish sausage and cabbage. These are like mashed latkes! 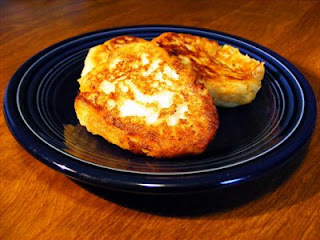 Yes, they do taste like a latke but NOTHING beats a good latke with applesauce and sour cream.